GLOBAL - The Vencomatic Group introduces a complete packaging solution for the handling and transportation of eggs: Ovologic. Ovologic was designed using its vast knowledge on dividers, a Vencomatic Group innovation and the first step towards automated palletizing of eggs. The Ovologic trays, dividers and pallets ensure fast, safe and efficient handling and transportation of eggs from the farm to the grading / packing station or processing industry. Minimizing hairline cracks is one of the key topics in egg handling for both layer and breeder farms. 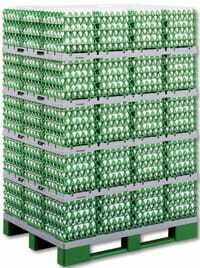 Strong trays, perfect fit and solid stacks results in optimal protection of the eggs. Research on Ovologic has shown a significant decrease in hairline cracks compared to other packaging materials.